Tooth loss is extremely common among adults, especially as we age. Rather than living with the discomfort and hassles of dentures, you can enjoy a more natural alternative by choosing dental implants provided by Precision Dental NYC. Dental implants can replace one or more missing or damaged teeth with a permanent solution that leaves your smile looking 100% natural and allows you to eat the foods you love again – in as little as one day. So why wait any longer to regain your smile and self confidence? Once we have met for a consultation and conducted a scan using the state-of-the-art cone beam scanner , we will establish where the teeth are to be placed before we surgically place the implants in your mouth. This part of the process won’t normally take more than a couple of hours and can sometimes be done in sixty minutes. 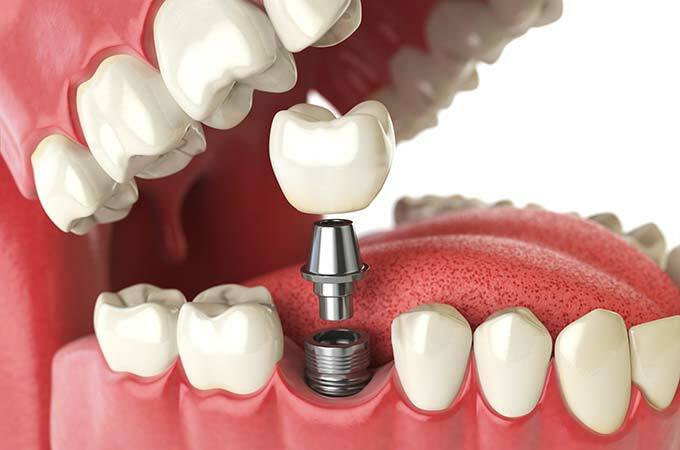 The implants will need to heal and fully integrate with your bone and tissue before we can connect the permanent bridges or dentures. It will usually take between 3-6 months for the adjustment to be complete. Precision Dental NYC works in an innovative, state-of-the-art surgical center designed to deliver exceptional patient care using the most advanced technology available, which includes a Cone Beam Scanner by Dentsply Sirona. Only a few practices in the region have this machine in their offices. The scanner provides pristine, 3D images of the jaw and mouth areas needed for dental implant surgery. As result, Precision Dental NYC is able to visualize both hard and soft tissue areas for a more thorough, comprehensive examination and better preparation.